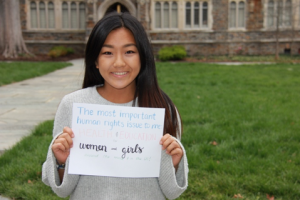 The Student Advisory Board of the Duke Human Rights Center@FHI hosted the annual Global Ideas, Local Impact event on March 28, 2018. Global Ideas, Local Impact is the Duke Human Rights Center’s annual celebration of human rights opportunities at Duke and in the world. The event includes a Research Slam, where students present their human rights research conducted throughout the school year, and an alumni panel, where alumni working in different fields related to human rights share their experiences and advice about human rights work. The Student Advisory Board for the DHRC@FHI is made up of both undergraduate and graduate students at Duke, and works to promote human rights debate and dialogue on campus through hosting events that seek to engage and inform the university about global human rights issues. The SAB also works closely with the Faculty Advisory Board for the DHRC@FHI by providing student perspectives at the biannual meetings, presenting event proposals, and participating in projects in coordination with faculty.The SAB meets regularly each semester to discuss new ways to promote dialogue about human rights both on Duke’s campus, in the United States and beyond. Current members can be found under the “people” section of the website.